I have never been known for my common sense. I once spent several hours on a hot Arkansas summer afternoon washing my husband’s truck as a surprise for him. When he got home from work I was disgusted because, despite my best efforts, I couldn’t figure out how to stretch my short arms enough to reach the top of his cab. He approached me with his slow swagger, and sweet smile, and after I explained my dilemma he opened the truck door, stepped up and washed off the top. Really? I had tried everything BUT that, including attempting to climb up the hood and jump far enough forward while standing in the bed (I’m sure it was quite the site for anyone who happened to drive by). Yea, I’ve pretty much always done things the hard way or paid for things because I didn’t know how (or couldn’t think of a way) to do them on my own. 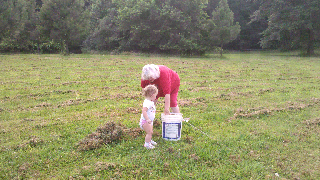 So I was brilliantly surprised the first time I heard that Chuck’s mom, Fay, and sister, Lisa, had gone to rake up some “hay”. Here we were paying forty-plus bucks every week and a half for hay when all we really had to do was wait for the county to come out and mow around our rural roads and fields and there was plenty for the taking! Sometimes the most brilliant ideas are the simplest. So true! I always do things the most complicated way, and I always figure it out the easy way, oh, about 5 years later. 😀 C'est La Vie! And what makes it worse is when you've spent 27 hours doing something that someone else comes along& says, "oh, why didn't you just…" yea, NOW they tell me! Lol!